February 27, 2018, 9:58 a.m. In recent years, fresh competition has provided mobile phone consumers with a greater degree of choice. With this comes a greater chance that people to switch from the ‘Big Four’ MNO providers (Vodafone, EE, O2, and Three) to MVNOs (the likes of Sky Mobile, BT Mobile, PlusNet Mobile, and Giffgaff). Our ‘Understanding the mobile operator switching market’ report indicates that around one in eight (12%) of those with a mobile phone switched network provider in the past 12 months. This is the equivalent to 5.6million adults. Our data reveals that the average cost of a tariff previous to switching was £17.83, while after a move the average spend is £16.13. This means that over, pre- £99,848,000 was being spent by this group prior to switching, against £90,300,000 after – a loss to the market of £9,548,000. The problem for MNOs is that our data shows that they are losing more switchers than they are gaining. Our figures reveal that two thirds (66%) of all switchers (over the past 12 months) left an MNO while only 45% joined one of the ‘Big Four’ providers – a 21% deficit. 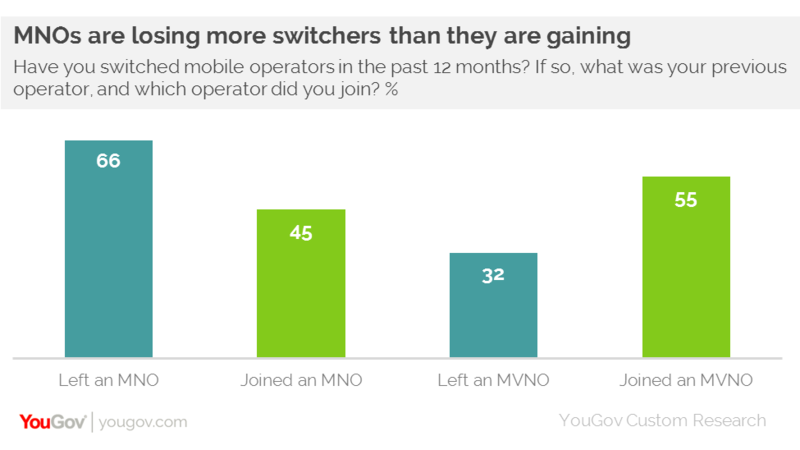 Conversely, while a third (32%) switched from an MVNO, over half (55%) joined one – a net increase of 23%. Where are customers moving to? Our data indicates that BT Mobile is the MVNO that has benefited most, with the provider seeing an 8% net gain in customers of over the past 12 months. It is narrowly ahead of PlusNet Mobile (6%) and Sky Mobile (6%). Both BT Mobile and Sky Mobile have been particularly successful in luring iPhone customers. BT Mobile has a net gain of 9% and Sky has 8% among iPhone owners. In both cases the primary motivating factor for the change was to take advantage of a special offer, deal or discount (31% for BT Mobile, 26% for Sky Mobile). Interestingly, while the MNO sector has experienced losses overall, Three has achieved a net gain in customers (5%). 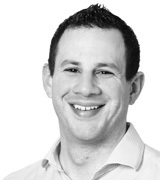 Three has bucked the trend because it has a value for money proposition. Close to half (47%) of those who joined Three said that the tariffs available offered good value for money. Similarly, four in ten (41%) said the tariffs met their needs, while 35% said the tariffs were the cheapest they could find. Furthermore, the data suggests that Three is also attracting customers from its nearest rivals, with 50% of joiners coming from O2 or EE. Multi-play services such as broadband or pay TV are an important factor in this. Having other services with a company was a motivating factor for many that moved to an MVNO. Of the total switchers market, 13% highlighted this as a reason, but it was far more common among those who moved to Sky Mobile (49%), BT Mobile (44%), Plusnet Mobile (27%) and Virgin Mobile (26%). It is evident that the threat posed by multi-play is not going to disappear any time soon. Indeed, the market has increased over time; from 5% in April 2015 to 8% in September 2017. As a group, switchers are discernibly different to mobile owners overall. 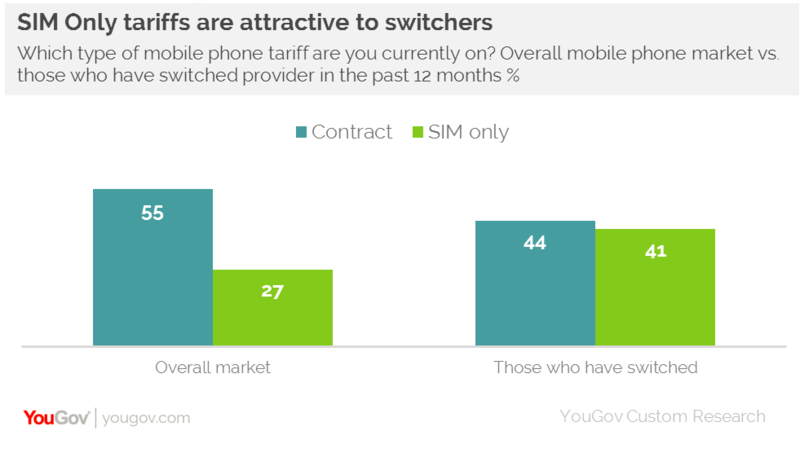 Looking at the market as a whole, 55% are on contract tariffs compared to 44% of those who have switched. Among owners overall, 27% are on SIM only deals, while this figure increases to 41% among switchers. This highlights the importance of price (as well as call minutes and data allowance) to switching. This is particularly true when it comes to people switching to Three. Almost half (49%) have moved from a contract and 27% changed from SIMO. However, 38% moved to a contract, while 48% changed to SIMO. Tied to this, our research suggests that many customers are holding on to their handsets when their contract ends then make the move to SIM only deals, rather than choose to upgrade to a potentially more expensive deal and get a new device. For example, currently 47% of switchers with iPhones are on a contract while 43% are on SIMO. However, prior to switching, 52% of iPhone customers were on a contract, just 25% were on SIMO. We also analysed ‘serial switchers’ – those who have been with four or more networks over the past five years. While there may be an assumption among the industry that those who move around do so frequently, our data indicates that this group is only 3% of the total switchers market. However, while 23% of all switchers say they are likely to change again in the next two years, the figure among serial switchers increases to 41%. However, while price may be important to switchers overall, it is relatively less important among serial switchers. Indeed, on average they pay £15.60 per month, compared to the £14.72 they paid with their previous network. Instead, they are dissatisfied with coverage or customer service, with 29% saying their previous network’s coverage for mobile internet/data was poor and 26% cited poor customer service or technical support as the reason for leaving. While price may have been the motivating factor when they initially started switching, it’s unlikely they will now find a cheaper deal and so prioritise other aspects of the package. So while it is inevitable that MNOs – which account for around 65% of the market – are always going to lose share, they are better placed to chase those customers that are looking to potentially spend more on longer-term deals. However, the market has changed greatly over the past five years and the threat of quad-play providers – such as BT and Sky – is very real. Please get in touch if you would like to find out more about the report ‘Understanding the mobile operator switching market’.